System Center Updates Publisher (Updates Publisher) is a stand-alone tool that enables independent software vendors or line-of-business application developers to manage custom updates. This includes updates that have dependencies, like drivers and update bundles. After you publish updates to an update server, you can then use System Center Configuration Manager to detect and deploy those updates to your managed devices. 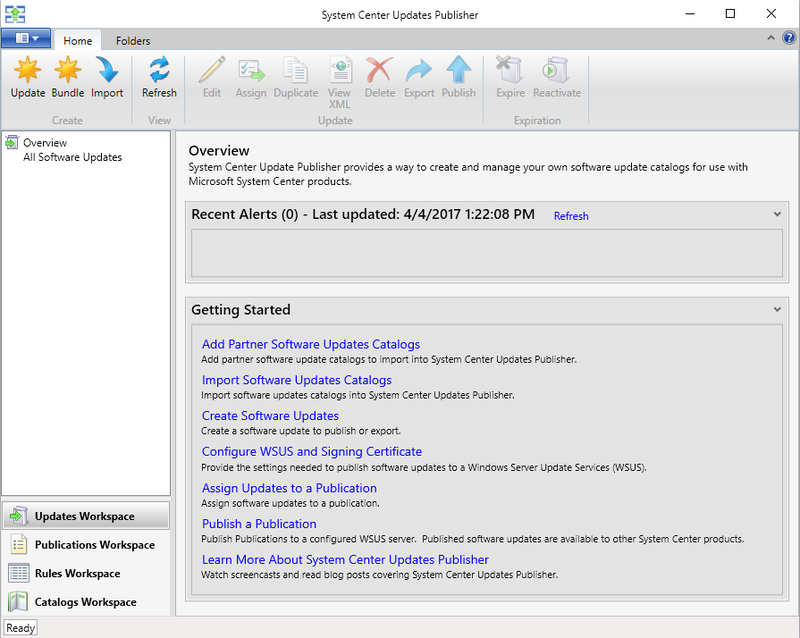 The previous version, System Center Updates Publisher 2011, remains in support. This updated version retains the same functionality, but supports additional operating systems, new features to simplify some tasks, and has an updated user interface. When you open Updates Publisher, it defaults to the Overview node of the Updates Workspace. Updates Publisher has four workspaces to help organize it. Updates Workspace: Use this workspace to create and manage software updates and update bundles. This includes assigning updates and bundles to a publication, publishing, and exporting to another Updates Publisher repository. Publications Workspace: This is where you manage publications. A publication is group of updates you create to simplify the export and publishing of the updates. Managing publications includes publishing updates to a server so your clients can find and install them, exporting updates and bundles for use by other Updates Publisher installations, or modifying the contents of or details of a publication. Installable rules – These rules help determine if a client should install an update. Installed rules – These rules verify if an update is already installed. Catalogs Workspace: Use this workspace to add and manage software update catalogs. This includes the import of software updates from those catalogs to the Updates Publisher repository. To get started, first install, and then configure options for Updates Publisher.